My guiding services span both educational workshops and expedition travel/adventure tourism. Facilitating the learning and adventures of others is a grand privilege and an enormous responsibility. In Nova Scotia, Canada, I offer intensive immersive workshops where participants learn to tune in to the avian dimension. See Birding-By-Ear Workshops below for more details. All over the world, I work in adventure tourism to help clients realize their dreams of traveling to our planet's most remote and spectacular locales. In addition to interpreting all things feathered, I also play a role on the expedition team as zodiac driver and polar bear monitor. See Expeditions below for more details. I'm also happy to plan and guide private small group birding trips upon request. ﻿﻿You are welcome to contact me personally with inquiries. Learning bird songs can be daunting but even experienced birders spend time each spring tuning their ears to the songs they already know. 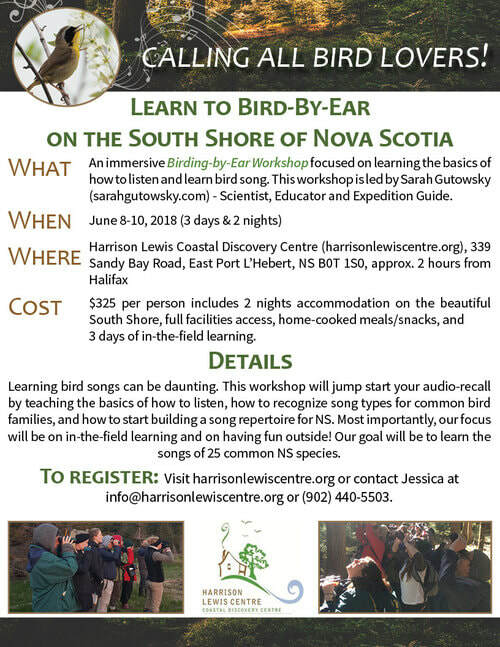 These workshops will jump start your audio-recall by teaching the basics of how to listen, how to recognize song types for common bird families, and how to start building a song repertoire for Nova Scotia. Most importantly, our focus will be on in-the-field learning and on having fun outside! Workshops will take place over the course of 3 days down on the South Shore of Nova Scotia, about 2 hours from Halifax. We'll stay at the Harrison Lewis Coastal Discovery Centre. We'll arrive the first evening and get introduced and settled in, then we'll spend the next full day from dawn to dusk completely immersed in listening to the local songsters and learning techniques. Our second day will start again at the dawn chorus, where we'll spend the entire morning practicing our skills together. Cost is $325 (includes 2-nights accommodation, full facilities access, and meals) and maximum number of participants for each workshop will be 15 to ensure the best possible learning experience. June 8-10, 2018. If interested, please visit the Harrison Lewis Centre website to register, or call or email Jessica at 902-440-5503 or info@harrisonlewiscentre.org for more information. Recently featured in the Queens County newspaper, The Advance - check out the article entitled 'Perfect place to learn Nova Scotia's bird songbirds' here! "Sarah's course introduced us to methods of identifying birds by sound. The listening techniques and the practice sessions she taught have opened up a whole new aspect to my recreational bird-watching. In the two days since I returned home, I have discovered bird species living close by that I seldom/never see and didn't realize were regular inhabitants. Sarah's recommendations on birding software programs, and her demonstrations of them while out in the field, were invaluable, and I am now training my ear by listening to online spectrogram collections, and identifying previously un-noticed species in the fields around home. I recommend this course to all birders." ​"As a total novice, I attended Sarah’s ‘Birding by Ear’ workshop with trepidation, wondering how much I would learn & expecting to come away feeling overwhelmed. Instead, it was exciting, engaging & so informative! I now know even someone with no birding experience at all will benefit from Sarah’s enthusiasm & extensive knowledge. Her presentations & explanations were easy to understand. Getting outside & actually finding & identifying birds we couldn’t always see, just by listening to their calls & songs was eye/ear opening! Sarah made the learning fun & do-able by breaking things down into simple, practical steps that meant we all took away new skills & a keen desire to practise those new abilities on our own. I highly recommend this workshop to anyone, whether an experienced birder or someone with no bird knowledge at all. Sarah will open up a new unseen world to you!" "Your ornithology knowledge is so amazing, but just as important and just as amazing, is your ability to pass on that knowledge to 'rank amateurs'! We've always loved watching birds, but it has been wonderful to add their songs to the experience. You were particularly patient with the group of somewhat older folks, who move more slowly than younger enthusiasts! The whole experience was entirely enjoyable. Many thanks!" "We just returned from a trip to the Ross Sea in the Antarctic where Sarah was one of the wildlife specialists. Her focus was on the 100+ species of birds that we saw during our expedition. Others on this site have described her excellence in the identification and science of the birds and we completely agree with these comments. She is great in this aspect of her job. What we’d like to add is that she really brings a sense of joy to the wildlife watching and it is contagious. Going out with her is not just a dry academic experience; it is going through a door to a world where nature is wondrous and it is there for all to see and even more, to become part of. If you get the opportunity to participate on a trip with her— TAKE IT." then be back to guide a group. She spent long periods on deck looking for (and finding) wildlife. She was always professional, always accessible to passengers, willing and very able to help in all the peripheral activities on board ship. We highly recommend Sarah." "I had the pleasure of spending nearly 3 weeks in the Falklands, South Georgia Island, and the Antarctic Peninsula with Sarah Gutowsky. Sarah was a pleasure to have as our expert onboard ornithologist. She gave informative lectures that struck the perfect balance for an audience with an extremely wide range of birding knowledge and experience. While she very patiently answered repeated, basic questions from novice birders like myself, Sarah adeptly and satisfactorily answered more challenging questions and assisted birders looking for species #5000. (This was conveyed to me directly by a couple of expert birders.) What I enjoyed most was sitting mesmerized on the edge of a black-browed albatross or rock hopper penguin or king penguin rookery, taking in the amazing site, and having Sarah quietly teach us (in real time) about all the amazing things we were witnessing. In addition to her knowledge base, Sarah shared her myriad of experiences doing research in remote areas of the world. Sarah is a very entertaining lecturer, and a kind, thoughtful, and energetic person. Her love of birds is infectious!" "Your contribution as the ornithologist on board was immense in my view. I enjoyed your talks about the various birds and the daily updates on what we saw and what to look for. You are very articulate and knowledgeable but your enthusiasm was a highlight for me. You made me want to learn as much as possible about each animal that we saw. Your excitement is contagious! All in all, a special trip and thanks for sharing your love of your work with us." "Sarah brings a vast knowledge and boundless enthusiasm for birding that is simultaneously educational and exhilarating. She has a unique talent of explaining bird identification and behaviour in a way that even the complete novice can understand, and you can't help but be utterly fascinated and enthralled with the information she provides. As a guide Sarah shows great respect for all wildlife, and helps everyone understand how to preserve and protect the species while at the same time enjoying the rare and unique opportunities to view and photograph them. She is a fantastic asset to have on any expedition, and I'm delighted to have had the chance to travel with her." - Jon Huyer, Canmore, Alberta. "Sarah was the ship’s ornithologist and wildlife expert on a wonderful summer trip we did with Adventure Canada up the wild coast of Newfoundland and Labrador. I doubt if you could find anyone more enthusiastic and knowledgeable – as well as a delight to be with. I don’t say that lightly as my wife and I have traveled widely – on ships and on foot – and have encountered many guides. She was always on hand – from dawn to dusk." "I met Sarah on a trip to the arctic in 2013 and again in the Antarctic in 2014. She was the ornithological instructor on board the boat. Sarah impressed me with her knowledge of birds and her passion she has about them. She is an amazing teacher and held the whole group captivated as she attempted to teach us how to identify different gulls, land birds, penguins etc. Her enthusiasm was infectious and many of us became keen bird watchers. Every session Sarah gave, was always full and people left the sessions keen to try out their new knowledge. As a teacher myself I was amazed at how she could hold our attention for so long. Many of the lectures on the boat caused people to fall asleep, but not Sarah’s. She was always patient with our questions and would take us on deck to demonstrate. Sarah must have spent hours going through our own photos and making sure we could identify the species. Sarah is full of life and has the ability to make everyone feel special and listened to. I told many friends about her and was really pleased to find she was on the same boat trip this year. An expedition trip like these really succeeds or fails with the choice of the instructors on board. With Sarah there would always be success as she combines her knowledge with fun and laughter and makes her talks very interesting." "If one is looking, you are likely to see birds, no matter where you travel on our planet, land or sea. If you are lucky enough to travel with Sarah Gutowsky, you will truly “see" the birds! Yes, Sarah will greatly improve your bird identification skills and assist you in adding to your life list, but she will bring so much more to your experience - a deeper appreciation of birds' behaviour and their astounding lives. Sarah shares an infectious love and passion for all birds developed over her many years of field work; getting up close and personal with feathered species from Gray Jays in Ontario’s Algonquin Park to the huge Wandering Albatross in the remote Kerguelen islands of the Southern Ocean, 3300 km distant from the nearest populated centre. Her research interests focus on using a variety of tracking technologies to determine where sea birds travel and feed when we are not there to see them. Sarah is able to turn her science into engaging stories of birds lives and gladly shares them. It is only with this better understanding of the complex lives of birds that the impact of human activity can be assessed and hopefully minimized. After travelling with Sarah you will be looking for and “seeing" the birds wherever you go!"